Sunday April 28th 1878 I got my work done so I went to church. Rob went with me. When I helped get the dinner over I took May and me went over to Wildes a little while. I went to hear Mrs Washington lecture in the evening. I enjoyed it very much. A most beautiful day. 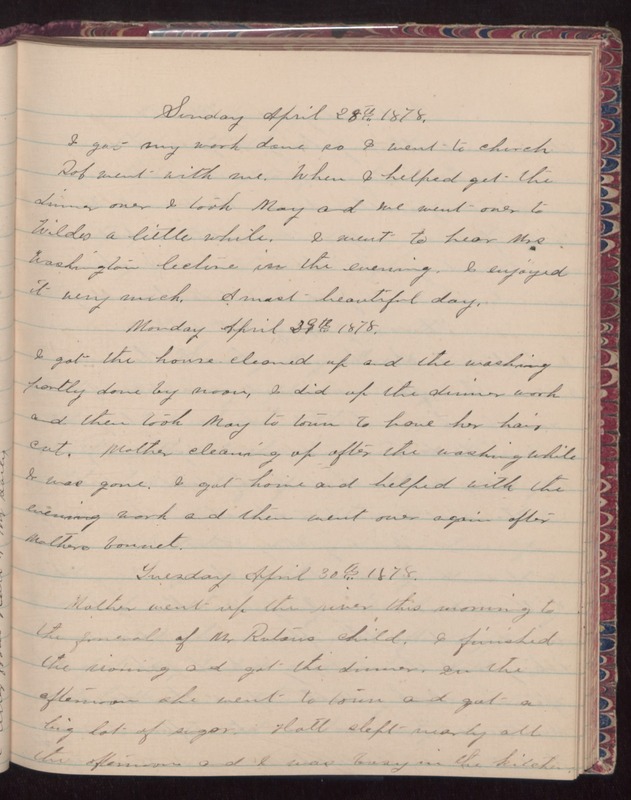 Monday April 29th 1878 I got the house cleaned up and the washing partly done by noon. I did up the dinner work and then took May to town to have her hair cut. Mother cleaning up after the washing while I was gone. I got home and helped with the evening work and then went over again after Mothers bonnet.Tuesday April 30th 1878 Mother went up the river this morning to the funeral of Mr Rutans child. I finished the ironing and got the dinner. In the afternoon she went to town and got a big lot of sugar. Hatt slept nearly all the afternoon and I was busy in the kitchen.